View More In Ice Buckets - Page 2. If you take pride in your bar-tending credentials, you'll need an ice bucket that looks as cool on the outside as it feels on the inside. Ice is an essential component of everything from the humble gin and tonic to the most elaborate and exotic of cocktails. 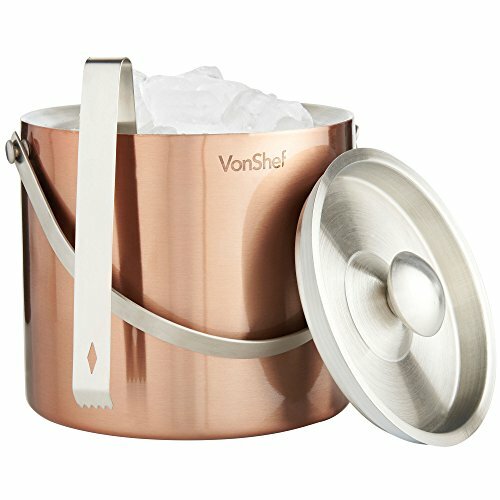 Whether you choose to make your own cubes or prefer to buy a bag, the VonShef Ice Bucket will help keep any party on track for success. The VonShef Ice Bucket has a cool profile, featuring an on-trend stainless steel satin finish. Its large 3 liter capacity will hold plenty of supplies for dozens of drinks, without having to pop back to the freezer every few minutes for a top up. Double-walled construction ensures ice stays well and truly chilled, while the lid provides added insulation when the bucket's not in use. The set of tongs means you can handle ice without resorting to a kitchen spoon. Constructed from high quality grade 202 stainless steel with contemporary satin finish and integrated handle - so you can carry the ice bucket with ease. Perfect for keeping cubes ice cold at BBQs, parties, bars, clubs, restaurants and more. STYLISH DESIGN: Stylish brushed copper - Perfect for BBQs, parties, bars, clubs, restaurants and more!